London, J. Maas, John Ruskin and his Circle, 11-28 June 1991, no. 29, illustrated. Wallington Hall was the house of Lady Trevelyan, Ruskin visited there on three occasions, in 1853 when on his way to Scotland with his wife Effie and John Everett Millais. In 1857 when he helped with the mural painting of the new hall and again in 1861. 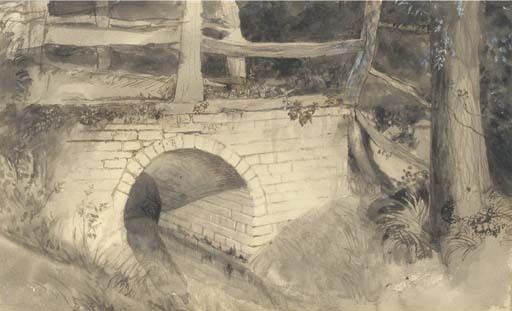 It has been suggested that the present drawing may date from his first visit as stylistically it relates to drawings he made in the 1850s. For a note on the Churchill family and Ruskin see lot 89. We are grateful to Dr James S. Dearden for his help in preparing this catalogue entry.